No Fenders -Formula 1, IndyCar and A Whole lot more..: AUTOS: Blastolene - Say What? Ah, the synchronicity of it all; Nah, not that this story was abducted by the NoFenders Wormhole Vortex; Hya! But that I’d be off to thee Big Island just a month after watching a Clive Cussler Barrett-Jackson 1hr special episode on SPEED, (10/02/11) where there was a bit on a wacky 8,400lb Blastolene IndyCar-style special chassis that was 25-inches shorter then Jay Leno’s original “Tank Car;” Huh? This car ‘O lore turned out to be a glittering Watson Roadster devoid of any wings, Airboxes, wide tyres and overly annoying sponsor ‘Deckles; (decals) just a gorgeous Aqua (blue) chassis. As it was the 1960 winning A.J. 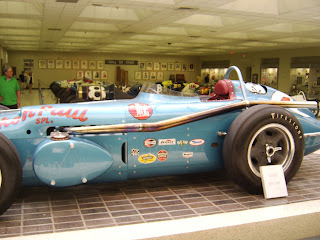 Watson Roadster driven by Jim Rathman.